Background: Low molecular weight 1,2,3-triazoles and naphthoquinones are endowed with various types of biological activity, such as against cancer, HIV and bacteria. However, in some cases, the conjugation of these two nuclei considerably increases their biological activities. 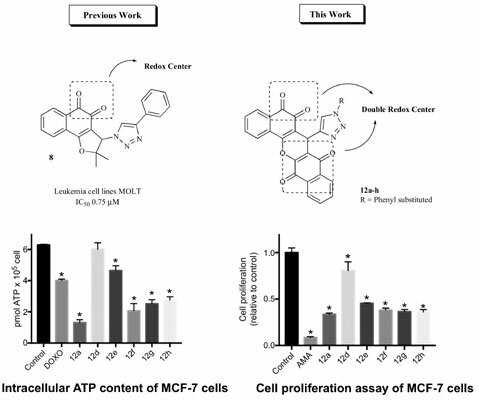 Objective: In this work, we decided to study the synthesis and screening of bis-naphthoquinones and xanthenes tethered to 1,2,3-triazoles against cancer cell lines, specifically the human breast cancer cell line MCF-7. Results: Starting from lawsone and aryl-1H-1,2,3-triazole-4-carbaldehydes (10a-h) several new 7- (1-aryl-1H-1,2,3-triazol-4-yl)-6H-dibenzo[b,h]xanthene-5,6,8,13(7H)-tetraones (12a-h) and 3,3'- ((1-aryl-1H-1,2,3-triazol-4-yl)methylene)bis(2-hydroxynaphthalene-1,4-diones) 11a-h were synthesized and evaluated for their cytotoxic activities using the human breast cancer cell line MCF-7 and the non-tumor cell line MCF10A as control. We performed test of cell viability, cell proliferation, intracellular ATP content and cell cytometry to determine reactive oxygen species (ROS) formation. Conclusions: Based on these results, we found that compound 12a promotes ROS production, interfering with energy metabolism, cell viability and proliferation, and thus promoting whole cell damage. Keywords: Cell viability, naphthoquinones, lawsone, MTT assay, ATP, CyQuant assay. Keywords:Cell viability, naphthoquinones, lawsone, MTT assay, ATP, CyQuant assay. Abstract:Background: Low molecular weight 1,2,3-triazoles and naphthoquinones are endowed with various types of biological activity, such as against cancer, HIV and bacteria. However, in some cases, the conjugation of these two nuclei considerably increases their biological activities.